Cover Love at Romance Lives Forever is a short intro to a book and includes a cover, blurb, buy links, and social media contacts for the author. 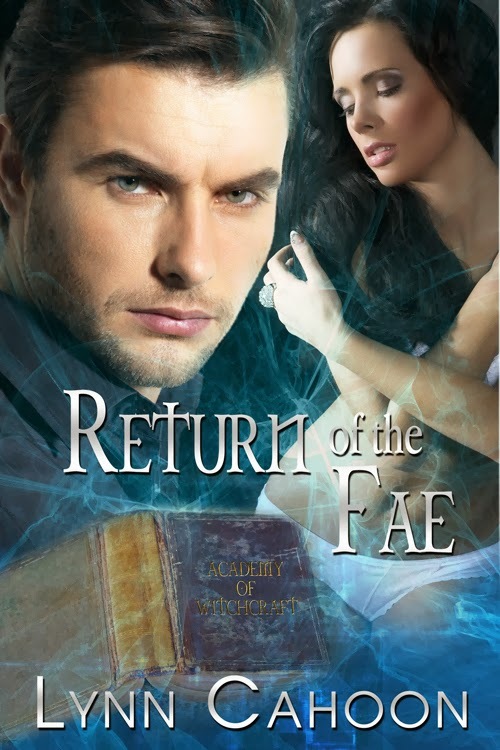 Today's featured book is Return of the Fae by Lynn Cahoon. A witch in training, a hunter on the prowl, and a world in jeopardy. Learning the rules of being a witch takes years, but Parris McCall needs to master them in only weeks. Knowing how to wield her magic is the one thing she has to keep her grandmother safe and herself alive. Ty Wallace is going mad with his desire for Parris, but he has to maintain an emotional distance from her. She's a distraction in his quest to find Coven X before they grow too strong, taking The Council and everyone he knows down with it. As Parris labors through the academy manuals, the couple takes a trip to find Ty's mentor. He's their only hope in helping Parris with her studies. To their dismay, the old man has disappeared. Their only clue comes from a witch banished for actions against The Council. When they return, not only do they find their own lives threatened, but casualties in the war between the covens have risen. And a new life hangs in the balance. Book sounds most interesting. Lovely cover. LIza - thanks. I love my cover. Kayelle - Thank you so much for featuring Return of the Fae.